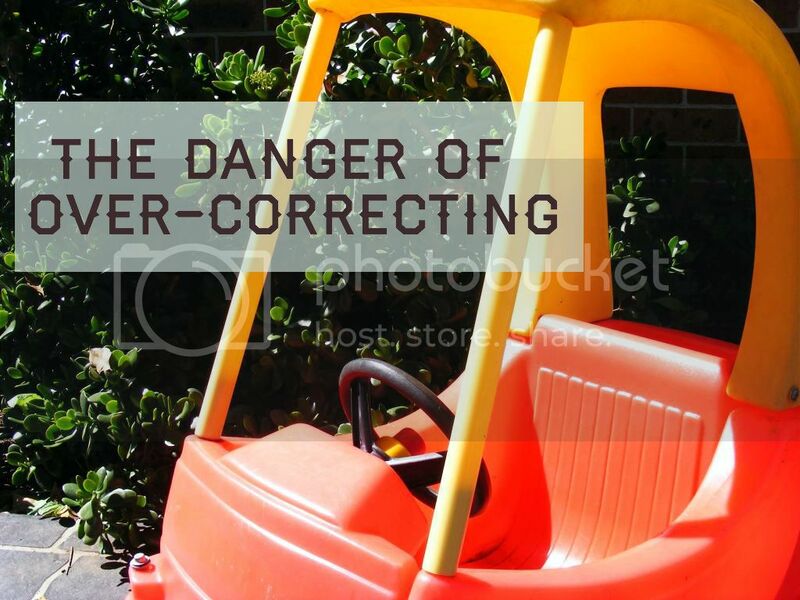 I first heard the term “over-correcting” in reference to driving. Imagine driving down the road when you’re suddenly distracted by your toddler attempting an escape from the car seat. You gradually veer to the left as you attempt to keep the fugitive strapped in. When you realize you are heading towards oncoming traffic you quickly jerk the wheel to the right and, instead of the straight direction you were on previously, you’re now headed right fast and in danger of running off the road, into a ditch, or into the pole holding up the McDonald’s sign. Hey-ho, that’s where you were headed anyway, right? In parenting, over-correcting is when we change our current course drastically in the process of troubleshooting. It often makes it difficult for us to determine the cause of the current issue and is rarely effective. A prime example of this happened a few months ago when my oldest daughter was 24 months. “All of a sudden” she started taking an hour or two to get to sleep for her afternoon nap. That is, if she took one at all. That time is when I normally work from home so after a few days I was fit to be tied and popping blood vessels all over the place. She stayed in her crib the whole time, but I knew she needed to sleep. So, I started to put her to bed at 6:30 or 6:45, about 45 minutes earlier than her normal bedtime. I was fearful she would get used to the lack of sleep and like it so I wanted to keep her well-rested. This went on for a few days and then something wonderful started happening. My 24-month old and my 13-month old started to sleep until 8 or 8:15am. I knew it wasn’t the best habit, but did I care? No. Why? I was pregnant and exhausted. I started thinking Babywise was indeed a sleep method from heaven and counted my lucky stars. Unfortunately, it was short-lived. Naps continued in a bad fashion until the time change came around, about a month into this bad napping phase. Then, finally, a light bulb went off. She was taking an hour or two to get to sleep therefore having a shorter nap. But, I was putting her down almost an hour early for bed and letting her sleep almost an hour later in the morning. In short, I had increased her nighttime sleep and weaned her of her nap. Accidentally. For shame! I stopped putting her to bed early, started getting her up at 7:30am as per the previous norm, and voila, naps came back to normal. I felt stupid for my mistake, but I was too busy celebrating to care. (1) In the food department. Another area we’re in danger of over-correcting is with our babies and toddlers diet. We can give enough food at snack time that they won’t eat at mealtime. Then, because we want them to sleep well, we give them a big bedtime snack. The baby may fight the breast during the day (as mine did when I became pregnant and he didn’t like it) so I tried to keep my milk supply up by feeding him at night long after he was sleeping through. Not wise. They may fight the veggies at dinner so you compensate by piling high the yogurt. Does that help teach them to eat what you serve them? No, it teaches them that when dinner isn’t good they’ll hit the jackpot with dessert. If they refuse something at the table (and I mean as a matter of habit, a mom knows the difference between a preference and a picky eater) then don’t over-corrrect by stuffing them full of what you know they’ll eat. It’ll only prolong the agony. (2) Matters of stimulation. I often think that our house is boring. I’m not a noise, a TV or a radio person. We wake up, play, go outside and do an activity or two and then have independent playtime. When my oldest got old enough that she actually needed some good physical exercise and a change of scenery, I started to up the ante. However, because I’m Type A and can’t stand to wait (raise your hand if you’re with me) I just started her doing all kinds of things. Result, too big an adjustment for her and inability for her to calm down and actually rest at naptime. I didn’t “wear her out” so she slept well, I overstimulated her brain so she didn’t. (3) Being harsh with discipline. I’m a firm believer in first-time obedience and I always mean what I say. No matter who I’m saying it to. With my first I thought – for some odd reason – that I needed to sound firm and slightly angry when instructing or correcting so my daughter would know I meant business. Later I realized she responded even better and quicker if I spoke firmly but kind with a sparkle of love in my eye (yes, I am a sappy mother). Enter the behaviour phases. You know what I’m talking about. All of a sudden they act like they don’t hear you. They look you dead in the eye and turn over their plate of spaghetti on the floor and say “uh oh.” Then I started reverting to being harsh or angry. I’d demand this or that and give a look that would kill the neighbor’s gerbil. Again, instead of simply being consistent and kind and carrying on per normal realizing she would align back to proper behaviour, I over-correcting by becoming Mean Monster Mommy thinking that was what she needed. This quickly turned into a “what not to do based on my bad experiences” post, but that’s okay. I’m not proud. I think that if you’re a Babywise mom, and if you’re concerned enough to regularly read parenting advice and tips then you’re enough like me that you can probably relate. We don’t like to troubleshoot one thing at a time because that could take days…weeks… We want to know the issue and we want to deal with it quickly and efficiently. “Wait and see” or “give it time” are phrases reserved for – dare I type it – attachment parents. However, as is the case with life, sometimes we just have to calm down and keep trotting along steadily. Tweak a little here and a little there and maybe even one thing at a time. It could take a while to figure it out and they could be out of that phase by the time we do, but over-correcting pretty much never gives us the results we want. We want instant success, not instant confusion. Keep truckin’, mamas, and when you think you just can’t take it anymore… well, keep taking it. It will pass and we’ll remember these days fondly. Rachel blogs at A Mother Far from Home on parenting, discipline, routine, the spiritual life with children, travel, household management and more. on Facebook page and her RSS Feed for all insights and mishaps. Should You Correct for Attitude? What's the issue with dare I say it…attachment parenting? Sounds pretty passive aggressive. Thank you so much for this post. I really appreciated your humility in being willing to share some of the mistakes you have made, despite obviously being a competent mother. My daughter is only seven months old, and I can already relate to several of the "over-correcting" faux pas you have made, including sometimes being harsh when correcting her instead of staying firm but kind. I have also been feeding her right before bedtime in hopes that she'll sleep longer through the night (because she recently went from being a 12-hour-a-night sleeper to an 11-hour-a-night sleeper). After reading your post, I'm thinking that maybe the just-before-bed feeding is the problem! So I'm going to tweak our schedule and see if I can get my 12-hour sleeper back! I'm so glad to see you say that other Babywise mamas are probably impatient too! Or mothers in general I guess…But we have been doing Babywise since our little girlie was 5 weeks old, and it works like a charm. But when something changes and I don't know what it is—you're absolutely right in saying we don't want to wait and see! It stresses me out to attempt a solution, only to find it was an incorrect assessment and I have to start over! Gah! I'm pretty sure there's a church song about having patience…too bad when I hear it I only want to stuff a sock….